Who's donating to Trump's campaign? This bot will tell you. Who's donating to Trump? This bot will tell you. It's not about public shaming, it's about transparency. A Twitter bot named @EveryTrumpDonor is publicizing the names of everyone donating to Donald Trump's presidential campaign. Federal Election Commission data is public, but a 31-year-old computer programmer named Adam Kraft said that most aren't aware of that. Kraft is behind @EveryTrumpDonor, as well as two other politically oriented Twitter bots, @EveryDemDonor and @EveryGOPDonor. Kraft -- who said he's developed roughly 10 Twitter bots in total -- has programmed the bots to spit out the contribution amount along with the donor's name, location and profession based on FEC data. Each bot tweets about once every 30 minutes. Since going live in December, @EveryTrumpDonor has tweeted nearly 7,400 times. It has roughly 240 followers. Individual donations range from $253 from a truck driver in Georgia to $2,700 from a rancher in Wyoming. Related: Can TrumpSingles make dating great again? Kraft, who lives in Chicago, has long been fascinated with campaign finance data. 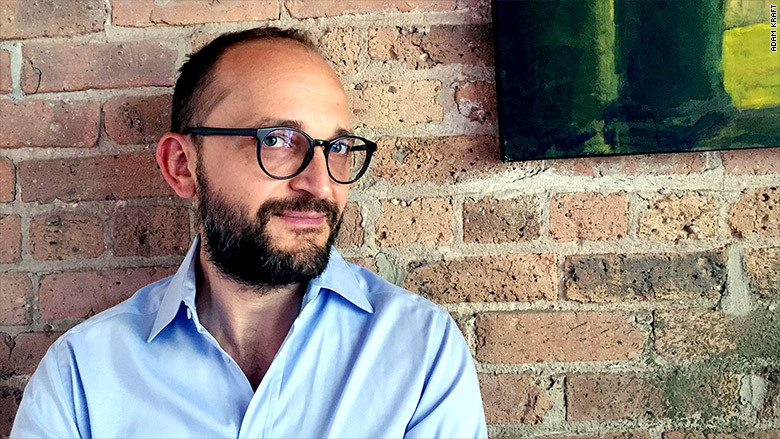 He previously headed up a startup called GeoPollster, which launched in 2010 and helped consumers track campaign contributions of the companies they frequent. When you "checked in" to a location on Foursquare, GeoPollster would surface federal election data, including congressional and presidential contributions. Adam Kraft creates Twitter bots in his spare time. "It helped empower [consumers] to make decisions about where to go, which businesses to support," Kraft told CNNMoney. Since shuttering in 2014, Kraft has been playing around with Twitter bots. 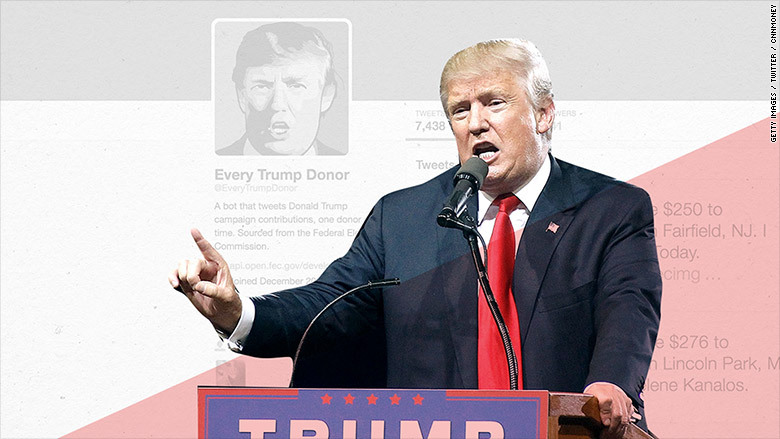 He said he launched "Every Trump Donor" in early 2016, after noticing that tweets about Trump donations had the most engagement on the @EveryGOPDonor handle. "I want to show people the power of technology and what you can do with technology by taking data and mashing it up with Twitter," said Kraft, who noted that about 50% of the tweets get favorited or retweeted. Kraft said that the @EveryTrumpDonor tweets can be used to counter a commonly cited belief that Trump is financing his own campaign. Trump, of course, has raised many millions of dollars less than Hillary Clinton. Clinton's campaign had $42 million in the bank as of May 31, according to its FEC filings, while Trump's campaign had $1.3 million. For those keeping a close tabs on the tweets, the bots have even randomly tweeted details of some high profile donors. George W. Bush gave $2,700 to Jeb Bush. Astronaut John Glenn donated $1,000 to Hillary Clinton. And, Jon Bon Jovi (or John Bongiovi) gave $2,700 to Chris Christie's presidential campaign.